This past October, I decided to take my children from our home in central South Dakota to my family's home in New Rochelle, NY, to visit their grandparents. I chose October because the weather is usually gorgeous with azure blue skies, warm days and crisp nights. It's our favorite time of year, and I thought that my parents would enjoy sharing fall activities such as pumpkin picking, raking leaves, and Halloween fun with the kids. We would get to go to the zoo, see the foliage, and venture to the mountains of New Hampshire to visit friends. Best of all my, kids would get to have their first Trick or Treat with their Poppy and Nanny. The warnings went up all along the coast on Wednesday and Thursday before Sandy. The kids and I had driven the six hours north to New Hampshire to spend the weekend with old friends. The weather was unusually warm and we went for walks in the woods along the many trails of the White Mountains. We knew the weather was coming Monday, so we got up early Sunday and drove as fast as we could back to New Rochelle which located roughly 28 miles north of New York City along the coast of the Long Island Sound. By Sunday, evacuations of coastal areas of Long Island and NYC were ordered. Monday morning started gloomy and very humid. The winds got stronger and stronger all day. It started raining. All the warnings called for storm surge, coastal flooding and strong winds. We knew the power would go out and be out for a while. Monday night was a sleepless one, the winds roaring outside, I could hear things like sticks and leaves hitting the sides of the house, I could hear branches cracking. Luckily, our old trees held their ground, and it never rained hard enough or long enough to flood our basement. Most of the damage in the neighborhood amounted to downed tree limbs and smaller branches, a few people lost roof shingles. Our neighborhood is over a mile from the actual coastline so was spared storm surge flooding. 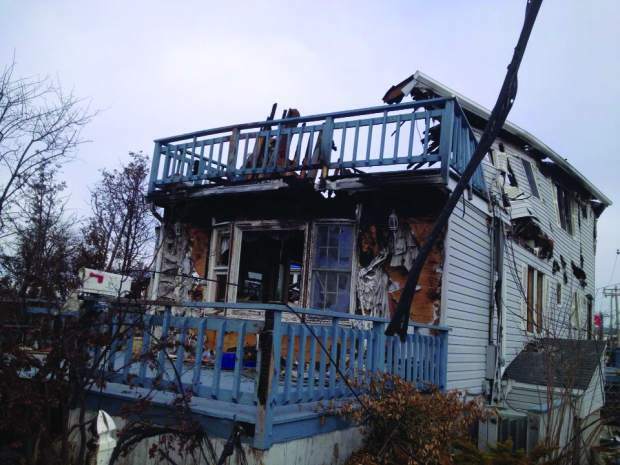 The next town over, Larchmont, where my brother is a volunteer firefighter suffered much more damage. 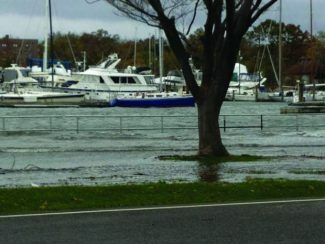 Larchmont juts out into the Long Island Sound; there was extensive flooding and damage to homes caused by the power of waves. Around 11 p.m. the night of the storm, my brother called to check on us from the fire department and had to cut us off because a boat had broken free of its mooring, and was floating down the main avenue of the town. The power was out for 7 days. We spent the days waiting in line for gasoline to run our generator. This experience got me thinking. There are plenty of horses in urban and suburban areas. Where do they go? How does one safely evacuate a horse? I called several police departments in coastal cities on Long Island. The answer I got was the same. The police and emergency service workers in urban and suburban area are neither equipped nor trained to handle livestock in emergency situations. "Most firefighters and police have never been with a horse up close, let alone handled a frightened one for an emergency," said one Larchmont, NY, volunteer firefighter, "We're here to pump out flooded basements, and rescue people trapped in their homes by debris, and of course put out fires." Luckily, the majority of horses and equestrian facilities that could have been affected by Sandy are located inland, away from the beaches, and none were damaged. There is a community resource Facebook page called Horse Evacuations East that connects these horse owners with help. 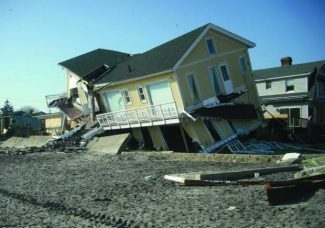 The hurricane season of 2005, however, was a wake up call for many, even though they may not have been affected by the storms that ravaged parts of the southern United States. 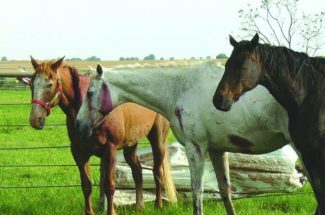 Horse owners quickly learned that we need to have emergency plans in place to keep our beloved pets and livestock safe and out of harm's way. Kurt Cruickshank is a Technical Animal Evacuation Specialist for the South Dakota Department of Agriculture's Wildland Fire Division. 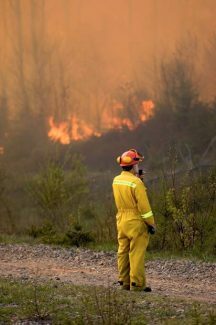 When it comes to emergency evacuation Cruickshank is the main resource for the Wildland Fire Division in South Dakota as well as other states and was on hand for the aftermath of Hurricane Katrina. Cruickshank recalls, "We had a huge response of helpers and volunteers after Katrina. The local jurisdictions didn't know how to handle it all. People showed up with trailers to move horses out of the area, those people weren't registered with any local authority as to where they lived or where they were going, and many horses disappeared. It was chaos and some dishonest people used it as an opportunity to steal valuable animals." Mr. Cruickshank insists that all horse owners in emergency situations need to have all their paperwork in order, health certificates, brand papers, registration papers. Owners should have permanent identification for their animals such as brands, tattoos and microchips, but also some form of temporary ID as well. Horse halters with your ranch name or phone number embroidered on them are great. "One girl had spray painted her pony's hooves hot pink. We found that pony out of hundreds at an evacuation center," says Cruickshank. One suggestion is spray painting a phone number on dogs and horses for when they leave their owner's custody. Collars, tags and halters are easily lost. The first step in emergency planning is to know what threats may exist in your area. Are tornadoes common? Do blizzards knock out electrical supply and close roads for days? Is the area prone to flooding or drought? While hurricanes may not be a worry in the northern plains, other natural phenomena might be. Most ranchers have a drought contingency plan, but fail to plan to be buried by snow. 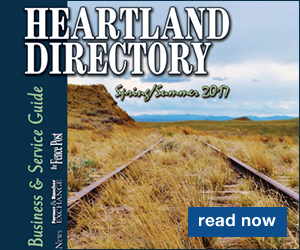 Laverne Hermanson of the South Dakota Department of Agriculture's states, "Snow and ice storms are an issue and the ice storm of 1997 taught many some tough lessons in emergency preparedness, there was a high death loss in South Dakota." Feed had to be airlifted to cattle and horses by the Department of Agriculture. The western United States was no stranger to out-of-control wildfires this past summer. "There's a lot of people living in the Hills, (Black Hills of SD) up in those trees, who have horses," says Cruickshank. "People choose not to evacuate and it becomes a situation simply that we can't get them out. 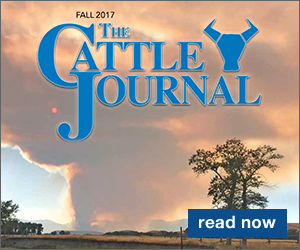 There comes a time in a wildfire where our jobs and our lives as emergency responders are bigger than that of the livestock stranded there." A ranch located five miles from a rapidly moving fire, could be in flames in a matter of minutes. 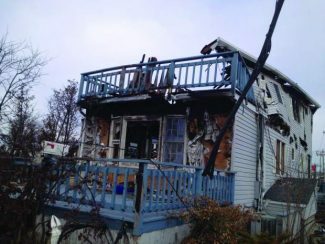 Unlike hurricanes which have warnings for days to prepare, many fires happen suddenly, and often in the middle of the day when some people are away from home. So what's a horse owner to do? The first thing to do is to formulate a plan to get family and animals to safety. Whether dealing with storms in coastal areas or fires in the mountains, heed the warnings and evacuations. Waiting until it's too late to get out puts a person at risk and emergency services may not be able to, or will not risk their lives to come into the area for rescue! If animals are evacuated as a precaution, and nothing happens, then the horse had an unnecessary trailer ride – a better outcome than if he or she hadn't gotten out in time. •	Do I have a trailer that fits all my horses? Many horse owners in urban areas have no trailer at all. Many rural horse owners have twelve horses and a two horse trailer thinking they'll only need to haul one or two animals at a time. •	If I don't have a trailer who will I call for help and will they need the trailer for themselves? •	Will I be able to feed and water the animals if the power is out? •	Do I have enough feed and water to take along if I leave and won't be able to come back? Part of Cruickshank's job is to provide feed and water to animals during and after the emergency. "Sometimes we have to move livestock back into the area already burned, because its safer there, and we provide them with feed and water because the owners are still under mandatory evacuation orders," he says. Check with your local community. Often times, the local fairgrounds, riding facility, or rodeo grounds are chosen to serve as an evacuation center for livestock. Keep in mind that with a large fire, you may need to evacuate to other communities miles away. •	Keeping your horse's or pony's vaccinations current. •	Keeping your horse's registration papers. Keeping Coggins tests current. •	Keeping health certificates and other important papers handy. •	Keeping at least a two week feed supply on hand. •	Make a plan as to how water can be stored or accessed during an emergency. •	The safest housing for your horses in any weather – are they safer outdoors? •	Planning an evacuation route and what transport you will use, especially if you don't have a horse trailer. •	Keeping a well stocked basic first aid kit on hand. AVMA.org has a list for things to stock it with. •	Keeping a two week supply of any specific medications your horse/dog needs. •	Permanent identification (brands, tattoos, microchips) and temporary ID (paint, tags, bands). Horse owners must remember have a plan to get out, to think of all the items needed for horse safety and care while evacuated and away from home, to be proactive during an emergency and to get out before it's too late!